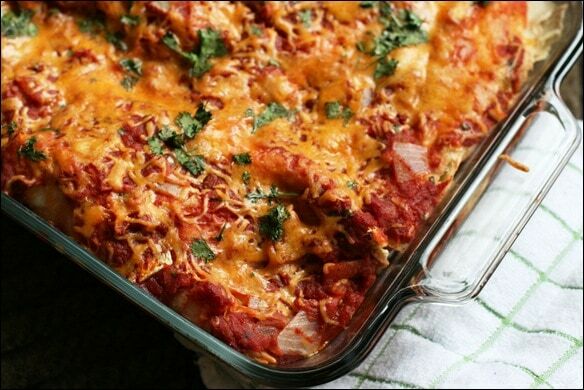 Enchiladas gone healthy — yogurt instead of sour cream and half the amount of cheese. Still delicious. Enjoy! 1) In a large bowl, mix together the cooked chicken, chopped green chilies, yogurt, lime juice, cracked pepper, and cumin. Set aside. 2) Make your enchilada sauce, recipe and directions below. Enchilada Sauce Instructions: Heat the olive oil for one minute in a medium saucepan over medium heat. Add in the onion, garlic, and spices; saute for 5 minutes. Add the tomatoes, sugar, vinegar, and cilantro; stir and bring to a simmer. Cover and cook 20 minutes. 3) Lightly oil/cooking spray a 13 x 9 baking dish. Spread a thin layer of the enchilada sauce in the bottom of the dish. 4) Set the first tortillas into the baking dish. Spoon one tenth of the chicken mixture into the center of the tortilla and roll it up, placing the seam side down. Repeat for the remaining tortillas. 5) Pour the rest of the enchilada sauce over the tortillas and sprinkle with shredded cheese and cilantro. 6) Bake at 350 degrees for 20 minutes, until cheese is melted, sauce is bubbling, and enchiladas are hot. 7) Serve warm with salsa, hot sauce, or guacamole, if desired. 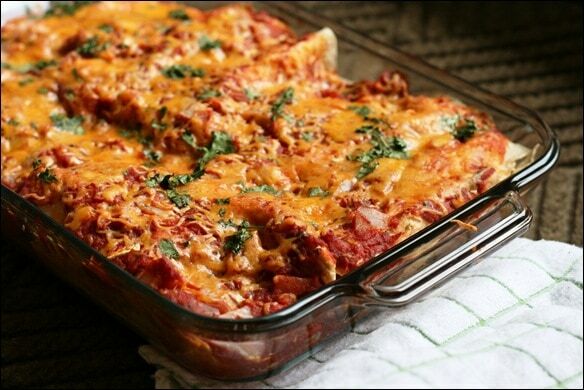 Check out the original post for lots more photos/commentary: Easy Yogurt Chicken Enchiladas. I have made this recipe twice now and I think it is amazing! Thank you so much for sharing! I’m going to make this for my Super Bowl Party today… but I’m wondering if it’s possible to do it without the tortillas to make it easy on the carbs. Good idea, or bad idea? I would leave it as is. It would still taste good, but without the tortillas it would look like a huge blog of mess. :) Plus, carbs are good for you – at least when they are healthy whole carbs. Obviously you’re right! Took your advice and boy are they a crowd pleaser!!! Yay I’m glad to hear it! This recipe sounds awesome! I’m going to have to try it this week with my family. Thank you for this delicous adapted recipe! Do you know the nutrition facts on this? I’m sorry, I don’t! If you want to calculate them, sparkrecipes.com is a good site. A girlfriend & I made this last Sunday. We were in a hurry so substituted canned green enchilada sauce . Turned out great! Going to try your sauce next. Thanks!